2016, US, Drama, 123 min. 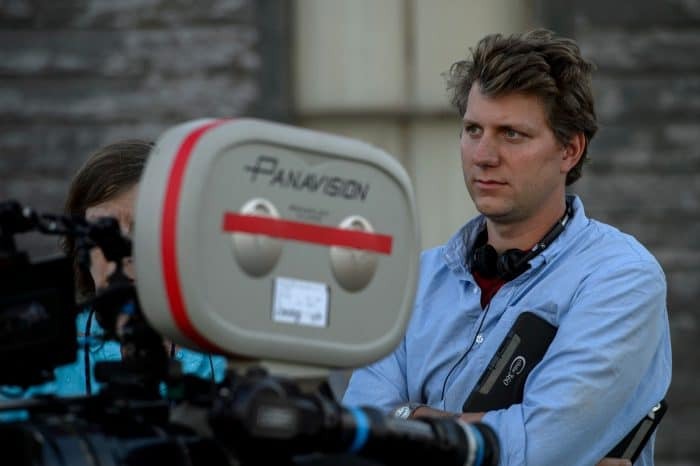 Loving is director Jeff Nichols’ most acclaimed film yet and the one most likely to win Academy awards. It has been featured in film festivals in Cannes, Toronto, Austin TX, Mill Valley and Telluride CO. This American story of challenging struggle and ultimate triumph is brought to life wonderfully by two actors from the UK and Australia. Ethiopian-born Ruth Negga is Mildred Delores Jeter. Australian actor Joel Edgerton is Richard Loving. In the 1950s Jeter and Loving grew up together in Caroline County, Virginia in a blue collar neighborhood. This was a time when working people had an ice box in the kitchen, a water pump just outside, chickens in the yard, crops growing nearby. Blacks and whites mixed freely at hotrod races and blues clubs, as long as no one drew attention from authorities. Mildred Jeter and Richard Loving drew attention when they decided to be married legally, and drove to Washington D.C. to become husband and wife, accompanied by her father. Once they returned to Virginia, they found themselves in the crosshairs of local authorities intent on enforcing laws against interracial marriage. Mildred and Richard thought they could live quietly and no one would notice. They were wrong, and their simple quest for the right to marry and raise children took them all the way to the Supreme Court of the United States. Nine years later, the Supreme Court gave them legal protection by invalidating anti-miscegenation laws across the country (Loving vs. Virginia – 1967). 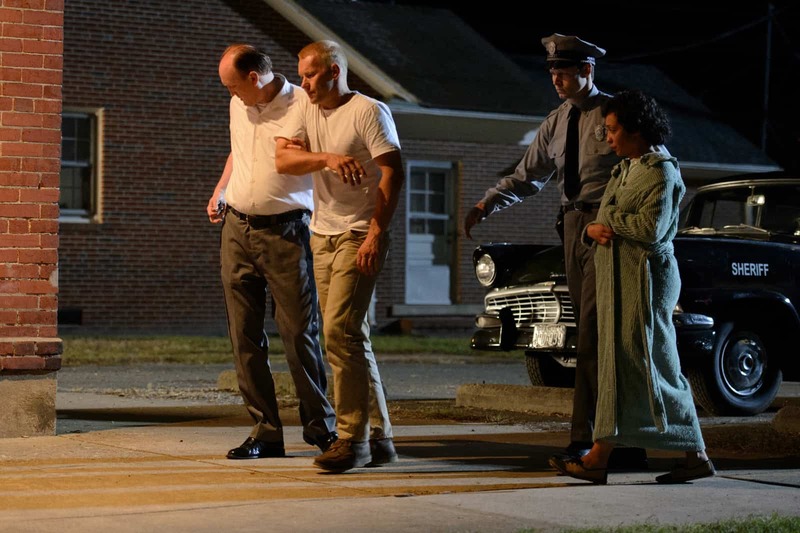 This nine-year struggle to live a normal life while fending off hostile law enforcement is at the heart of Jeff Nichols’ film. There is no shortage of material for Nichols or his actors; both media coverage and legal documents exist in abundance. And there was a very good television drama in 1996, starring Timothy Hutton and Lela Rochon. What is remarkable is that Nichols is presenting a part of America not often remembered – predominantly rural folk living quietly at a time when the civil rights movement (so well known today) was in its infancy. When Mr. and Mrs. Loving began their quest for the right to live in their town, they knew only that they wished to be safe in their home, and a lawsuit seemed to be the only lasting way. What is remarkable is that Nichols is presenting a part of America not often remembered. Loving is a quiet film, depicting an essentially private couple whose lives became public through no fault of their own. 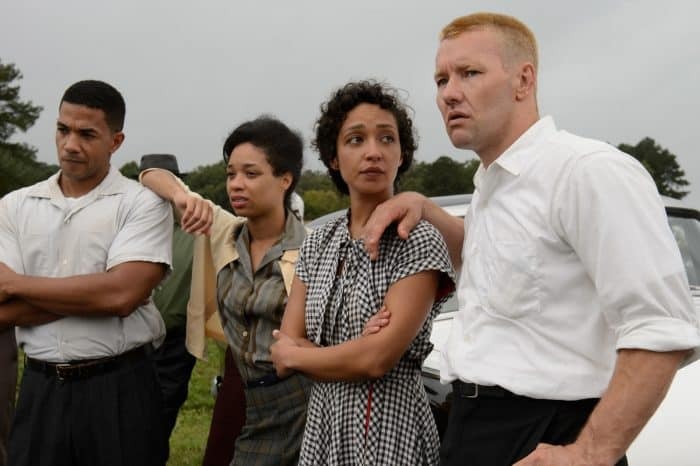 Actors Ruth Negga and Joel Edgerton did their homework, which was about so much more than perfecting American accents. The rich tapestry of their lives, living the way many couples would still live if they had the opportunity, dominates the film. Simple meals together, cooked at home. Time with family was paramount. Fresh air, sunshine, two-story wooden homes built from scratch. Everyone acquired a practical skill; Richard worked in construction and was a wizard at repairing cars. His mother was a midwife. People could and did cope well with little money. The unadorned, rich details of their physical surroundings call to mind the work of director John Sayles in Honeydripper and Lone Star. Director Jeff Nichols on the set of LOVING. We are accustomed to viewing civil rights films dealing with a more confrontational form of racial aggression when the heroes must face violence or strong physical danger. Movies such as 12 Years A Slave do pack a powerful punch. Almost forgotten, though, are situations such as those we see in Loving and also in Richard Pearce’s The Long Walk Home (1990) with Sissy Spacek and Whoopi Goldberg, where taking a moral stance creates unforeseen circumstances. Mr. and Mrs. Loving were not formally educated and were people of few words. Richard’s body language and Mildred’s expressive face spoke for them. He wanted to take care of his family. She wanted to raise her children where she grew up, in a green and open space where kids could run free. Because of these simple wishes, they took on the might of Southern segregation, and changed American history in the process. Nuanced and unforgettable performances. A wonderful outcome. A forgotten but vitally important part of American history.